We love red wine in our home, but who likes the bitterness of those tannins from a freshly opened bottle? It's really not tasty just to open a bottle to let the red wine breathe because the narrow neck of the wine bottle isn’t sufficient enough to get oxygen to the wine. 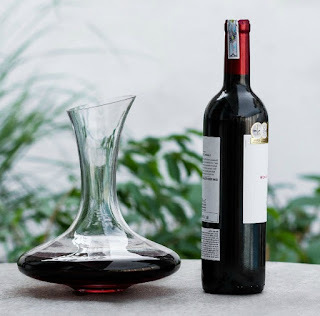 This beautiful decanter seems to be the answer to not only allowing wine to breathe properly, but also a lovely way to serve the wine. I enjoy the simplicity of having the decanter on our table any night of the week, when it’s just Mr. Hubs and me. This wine decanter from Bella Vino is made just the right way to aerate or decant wine. It's been elegantly designed from lead-free crystal glass to soften the flavor of your red wine before you drink it. Even thought it was made from thick and durable lead-free crystal, it is lightweight and very easy to pour from. The glass isn't without flaws, but I think these little flaws add character to the decanter. The Best Red Wine Decanter By Bella Vino is available for $35.95 on Amazon.